Colonial merchant of New York; born in 1721; died in New York in 1789. He engaged in business at an early age, and is mentioned as the owner of a privateer and as engaged in the fur trade in 1760 (see "New York Mercury," Aug. 17, 1761). In 1765 the signature "Hayman Levy, Junior," was appended to the Non-Importation Resolutions drawn up by merchants in Philadelphia, but it can not be said with certainty that it was the signature of the Hayman Levy treated here. In 1770 Levy signed in New York resolutions of a similar but more stringent character. In 1768 he failed in business, but soon recovered his losses. The occupation of New York by the British caused him to remove to Philadelphia. On July 20, 1776, he is mentioned in the Journal of the Continental Congress. 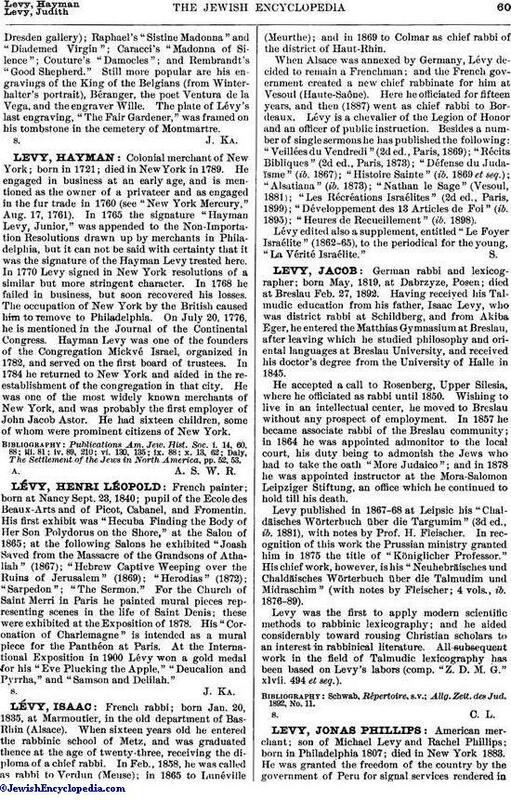 Hayman Levy was one of the founders of the Congregation Mickvé Israel, organized in 1782, and served on the first board of trustees. In 1784 he returned to New York and aided in the reestablishment of the congregation in that city. He was one of the most widely known merchants of New York, and was probably the first employer of John Jacob Astor. He had sixteen children, some of whom were prominent citizens of New York. Daly, The Settlement of the Jews in North America, pp. 52, 53. A. A. S. W. R.